Cheval Hyde Park Gate is waiting for your visit this Summer in London! Ready for some shopping? That was a retoric question, we are always ready for a good shopping spree. So, if you are in London and have already seen all the must-go cultural spots, you are ready for this tip. The Bicester Village is a unique concept in outlet shopping. Part of the Chic Outlet Shopping®, it is defined by its luxury brands, charming open-air ‘village’ settings, a welcoming and superior service, a calendar of events and, not least, exceptional value for money. World-leading brands offer their authentic previous seasons’ collections with savings of up to 60%, and sometimes more, on the recommended retail price, in their own luxuriously appointed boutiques, all year round. +Bicester Village is home to over 130 designer outlet boutiques offering up to 60 per cent off previous seasons’ collections from the world’s leading fashion and lifestyle brand names including, Anya Hindmarch, Aquascutum, Bally, Cath Kidston, Church’s, DKNY, Hugo Boss, Matthew Williamson, Rupert Sanderson, Salvatore Ferragamo, Samsonite, Ted Baker and Temperley London. Set in Oxfordshire, close to the idyllic Cotswolds, Bicester Village is approximately one hour from London. 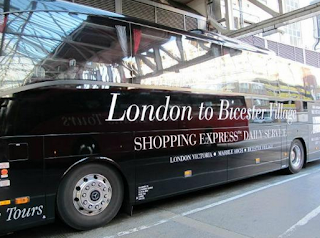 But don't worry, they have a shuttle service, the Shopping Express (£25 for adults, £20 for kids, round trip) or you can also hire a private chauffeur service (starts at £233 one trip). You can book both services directly from the website. - Return tickets to the Village on the Shopping Express™ luxury coach service from central London. - VIP Card providing a further 10% saving on purchases in more than 130 luxury fashion and lifestyle boutique. - Two-course lunch or dinner at either Busaba Eathai, Villandry Grand Café or Carluccio’s. 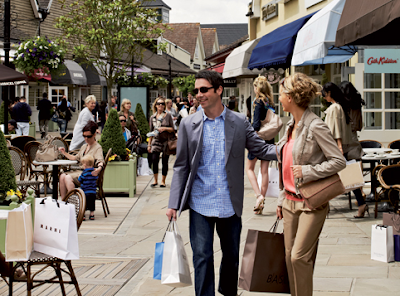 - £50 Prepaid MasterCard® Gift Card which can be used in the boutiques of your choice in Bicester Village. Open from 9am to 9pm in the Summer, 7 days a week, it is a great option for that lazy Sunday.